Zinc is a trace mineral that is common in many foods and plays many critical roles in your body. Zinc contributes to normal cell function and is helpful in the muscle growth process. 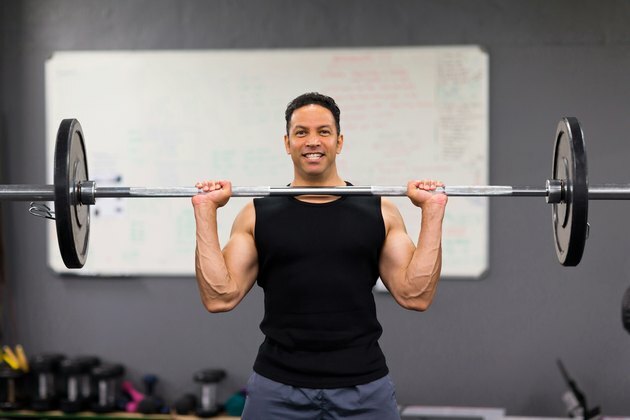 If you have a zinc deficiency, taking a zinc supplement can help balance your nutrient levels and improve your overall ability to build muscle from a resistance training program. According to the Linus Pauling Institute at Oregon State University, a leader in nutrient research, zinc plays three main roles in your body, all of which are crucial to muscle growth and development. Zinc speeds up muscle-building chemical reactions in your body, stabilizes protein structures and helps regulate the hormone levels in your body. These functions help assist the muscle protein synthesis process that accelerates after you perform a resistance training workout. Maintaining your current muscle size is critical to building new muscle. Zinc acts as an antioxidant in your body to prevent the breakdown of cells due to free radicals. By neutralizing the effects of free radicals, zinc can help slow the aging process and associated muscle loss. Additionally, zinc may help regulate your immune system so you are less likely to lose muscle due to illness. Zinc may play a significant role in growth for children. In 2007, the “British Journal of Nutrition” published a study that examined the relationship between serum zinc levels and the growth rate of children ages 6 to 13 in northeast Thailand. The researchers found that stunted males had the lowest serum zinc levels. A lack of zinc is more likely to occur among impoverished children due to a lack of nutritional quality. In these cases, zinc supplementation may enable better muscle and height growth. Though zinc is an important mineral for muscle growth, supplementation is not always necessary. The recommended daily intake ranges from 8 mcg to 13 mcg for adults. The American Dietetic Association advises athletes against taking zinc supplements for muscle growth because they often contain more than 40 mcg, which is the tolerable upper intake level for the mineral. Consuming excessive zinc can lower your high-density lipoprotein cholesterol level and affect your absorption of other essential nutrients — such as copper and iron. Consume zinc from whole foods like seafood, red meat and poultry. Ask your doctor if it is safe for you to consume a zinc supplement before beginning such a program. Can You Take Zinc to Gain Weight?